Located at Hollister Municipal Airport, Vintage Wings & Wheels focuses on quality Vintage aircraft maintenance, repair and restorations. Operated by Ernie Persich, a licensed A&P and I.A., Vintage Wings and Wheels is devoted to providing our customers with knowledge and quality service that they deserve. Ernie brings 40+ years of experience and dedication to maintaining and repairing aircraft. 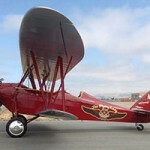 He has restored award winning Stearman Bi-planes and a 1929 New Standard D-25 airplane. 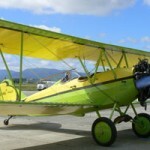 He is currently involved in restorations including a 450hp Stearman and a North American SNJ-5 trainer. We offer a wide range of services and experience. Please visit our facility page to learn more about what we can do for your vintage aircraft. Please feel free to call or e-mail us for information or answers to your vintage aircraft maintenance concerns. We look forward to hearing from you.